I'm going to visit a friend I haven't seen in a while, and we had some leftover pound cake from dinner last night (which, by the way, I highly recommend you bake! It's pretty easy to make a delicious-tasting cake from this recipe). Thanks for the link of the recipe! So cute of you to bring a present. ACK! 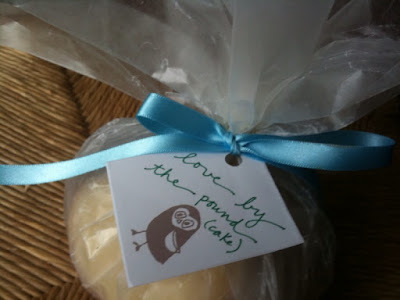 I am a pound-cake baker for about 13 years and I wanted to make little ones as favors for the wedding, but wasnt quite sure how to wrap them up! PERFECTION!